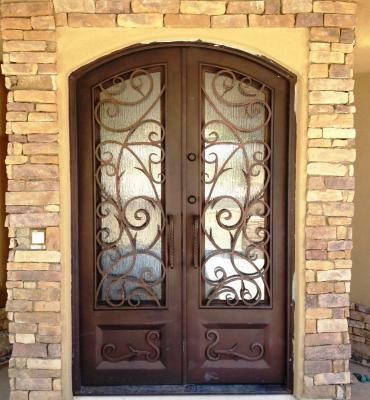 Signature Iron Doors is the Phoenix Valley’s leading iron manufacturer. We make it our business to provide a high quality door to please all who enter. The craftsmanship of Signature Iron Doors is without compare. This is a recent install done for a Phoenix family. After finding us online, they came to our showroom and saw this style door and asked if they could get the same style as a double door with a soft arch. Our technicians hand forge all our doors in every shape and size. So no matter your entry size, we will make a perfect fit. Call us and come visit our showroom in Phoenix Arizona to meet with a sales representative and find out your homes iron work potential.